My passion for cooking started at a young age. It was a tradition in my house that for every holiday we made and decorated sugar cookies. There were an assortment of other foods that we also made on a regular basis- chocolate chip cookies, banana bread, granola….. But these were all things that we made together- my mom, my sisters and I. But I remember the first time I made something on my own, all by my self. And I knew that I had found one of my greatest passions in life and that was the art of cooking and the joy of sharing my master piece with others. Ever since that day when I was a young lad, I have been cooking for people ever since. But I remember the very first things I ever cooked just like it was yesterday. In fact I don’t even have these ‘recipes’ written down- they are just there- there in my brain somewhere wanting to be pulled out. You see the first things I ever ‘cooked’- even though they were easy enough and yummy enough that an 8 year old could make them and eat them- I just guess that with time my palate has grown and my skills have become more advance that simple little things like Rice Krispie treats are too plain….. But wait, what the heck am I saying! You are never too old for Rice Krispie treats! Rice Krispie treats are the essence of childhood, they are what every kid in America traded their entire sack lunch for- an ewy-gooy Rice Krispie treat, every bake sale was sure to have them. So the other day Eric was asking for them. That got the wheels in my head turning… Rice Krispie treats eh? How could I make a good thing even better… could I make an already classic treat, gourmet? Well let me tell you I did. I never thought I would describe a Rice Krispie treat as being ‘rich’ but this thing totally is. It is my childhood in one little square package but with my adult personality rolled in. Melt butter over low meat. Once butter is melted add marshmallows. Let marshmallows melt down and add the caramel candies and half of the milk chocolate chips, stirring constantly. Remove from heat and add Rice Krispies. Press Rice Krispie mixture into a 9×13 inch pan that has been sprayed with non-stick spray. Melt remaining chocolate chips in the microwave in 15 to 20 second intervals; stirring every few seconds. 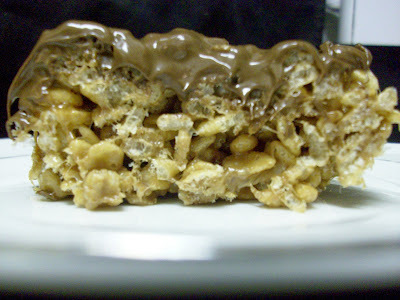 Pour melted chocolate chips on top of Rice Krispies and spread out. Enjoy! **Another thing that was a popular treat when I was a kid was the Little Debbie snacks. Eric reminded me of them when he said that these Rice Krispie treats tasted like Little Debbie’s Star Crunch. Awww the flavor’s of childhood!